Did you know that yesterday was National Ice Cream Day? Yep, I'm a day late! Seems that everyday is some sort of food day, and I just happened to make these ice cream cone cookies the other day for my grandson's 4th birthday party, at his request. As you can see they are not difficult cookies to decorate, but they sure are festive! 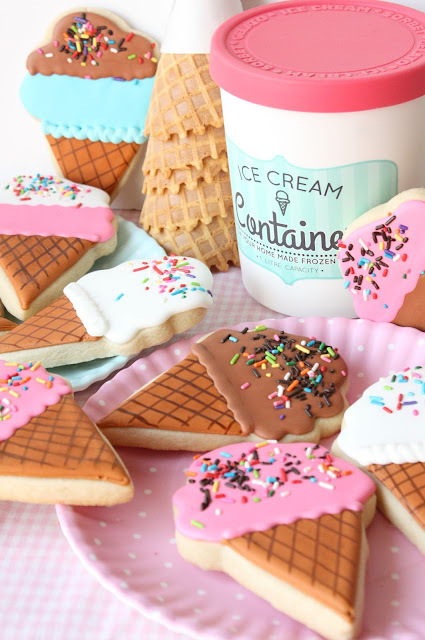 Ice cream cookies are some of my very favorite cookies to decorate! 1. Roll out dough, cut out cookies and bake according to recipe. Let cool completely. 3. Using different colored royal icing, outline the scoops and fill them. Add sprinkles while still wet. For a double scoop cone, add the bottom scoop and let dry it for about 20 minutes, then add the second scoop. 4. Add bottom borders to the ice cream, where it meets the cone. 5. Let cookies dry completely. * I allowed the cones to dry overnight and then, using a ruler and a brown food marker, detailed the cones. You may choose to detail the cones at the end, though the cookies must be completely dry. I would love one too! They are so adorable and delicious, Sue. 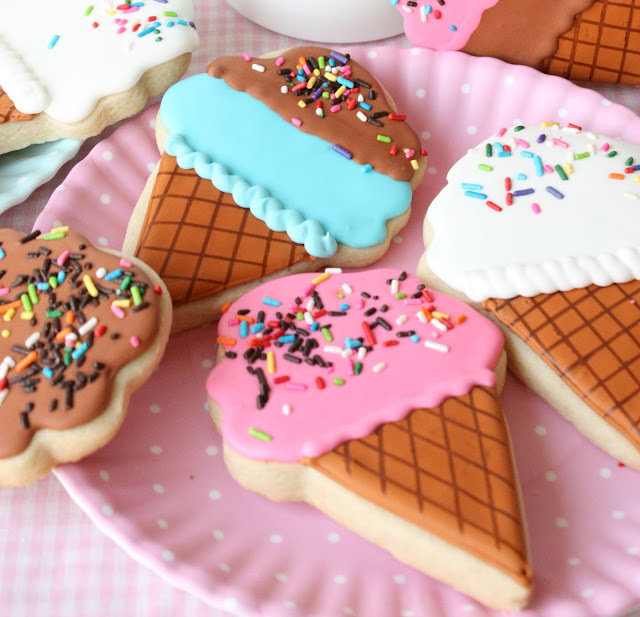 Sue, your ice cream cone cookies are absolutely adorable! What a lucky Grandson you have! Yeah, these ice cream cones are perfectly sprinkled. I would love to have one! You really did wonderful work. At some outdoor party venues Houston TX my niece’s birthday is also going to be celebrated. 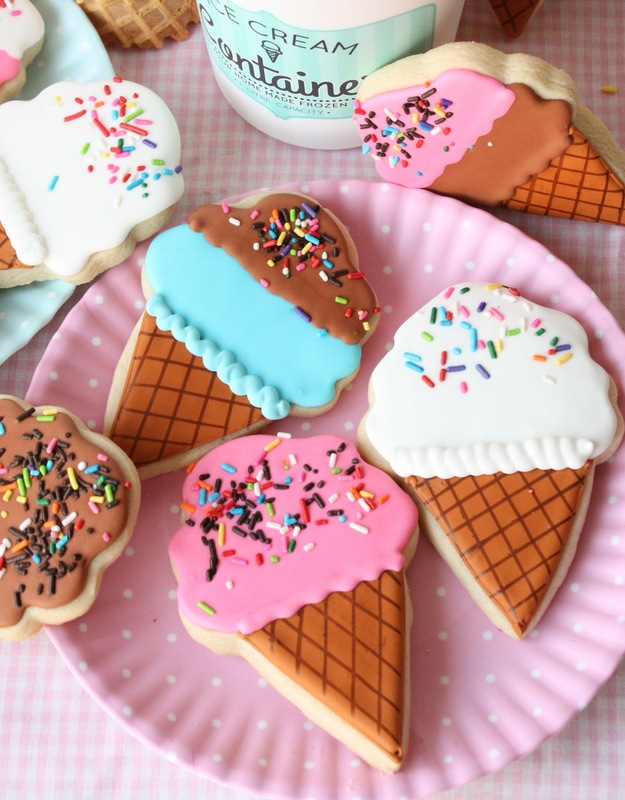 I am thinking to make such delish cookies for her birthday. Thanks for the recipe! A birthday is just the first day of Visit my site another 365-day journey around the sun. Enjoy the trip.